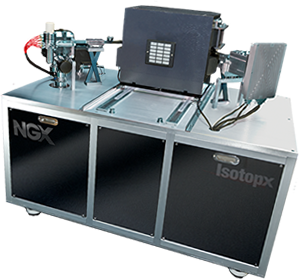 In collaboration with noble gas users around the world, Isotopx has developed the NGX, a multi-collector noble gas mass spectrometer able to collect any of the noble gases. It retains the simplicity in operation of previous generation instruments but uses modern developments in design and manufacture to produce state of the art performance. A high level of customisation is available with our extraction lines at Isotopx and working closely with the end user is of most importance when agreeing on final specifications. Preparation lines are mounted on specially designed aluminium frames allowing for a huge amount of flexibility during design as well as accessibility during use. The preparation bench is completely software controlled and integrated into the analysis software to create a simple easy to use system. Despite this we also have specific pre-designed preparation benches for certain applications.